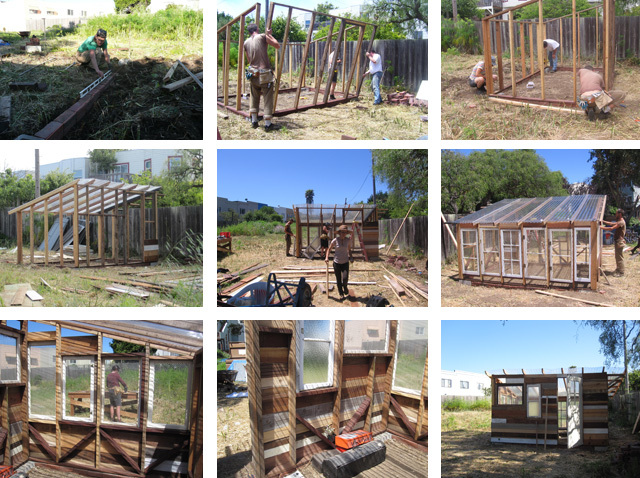 For the past few weeks, with the help of our friend Justin, we have been building ourselves a greenhouse. We needed some shelter on the property to anchor our activity, shelves to house things and plants, and a place to sit down protected from wind. 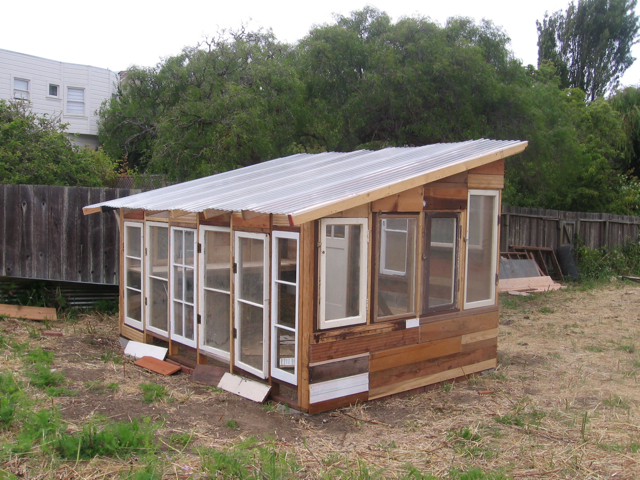 Without obtaining an official permit from the city, we were allowed to build structures under 100sqft, so we drew up plans for an 8x12ft (96sqft) building that could function as a mini-greenhouse and an office. Justin and I had taken a construction course this past year at Laney College in Oakland, so this project was a great opportunity to put new skills to work. I enjoyed the process so much, from design to material scavenging, from framing and raising walls to hanging doors and windows. We had to jog some old memories from geometry classes, and problem-solve some of our oversights. We got to put our aesthetic touch into every piece of wood that we cut and pieced together. Putting up this greenhouse felt like my favorite kind of art project: outdoors, collaborative, functional, putting old materials to new use. It is extremely fulfilling work to turn an idea and an image into a sturdy, physical construction that you can enter and take comfort inside. We managed to create it mostly from reused material. The only material that we couldn’t find on the streets, or at salvage yards was the polycarbonate corrugated roofing. Come by and see it some time, we are so proud! Special thanks to: Justin, of course, who devoted a few weeks of his skill and energy to this construction project. He is a priceless collaborator and problem-solver. To Bob Short, our endlessly supportive next door neighbor. He allowed us the use of his electricity and tools. He brought us beer on hot afternoons, gave advice, helped us raise the walls, and graced the door with a goodluck horseshoe. Thanks to Marriane Short for taking these photos. Thanks to Building REsources for salvaging our city’s discarded building materials, and for offering us a great deal on wood, windows and doors. i’d love to see it in person sometime and get some ideas. i just wanted to tell you that your greenhouse is beautiful. it has so much character. my partner and i lived in SF briefly but now run a small organic vegetable farm in Maine. we use a small greenhouse to start seeds in. it is a tremendous addition to the farm. keep up the good work – you guys really have an amazing aesthetic in addition to boldly producing real food in San Farancisco. congrats on the house and new land. Thanks for the nice words Gregory! You have some beautiful photos on your site too. 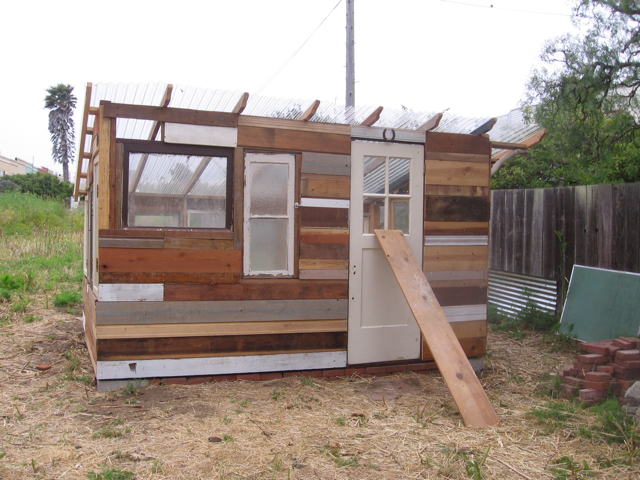 I love this – we are in need of a garden shed for our small native plant nursery and are inspired by your fabulous creation using recycled materials!